Eve Stockton’s woodcuts are inspired by close observation of nature and an eclectic interest in science. Utilizing a multifaceted background in architecture and art, Stockton is able to engage the variables of large-scale printmaking, allowing her to produce an ongoing body of dynamic, graphic images. Her individual prints and her groupings of related prints show her investigation of nature as well as her process. 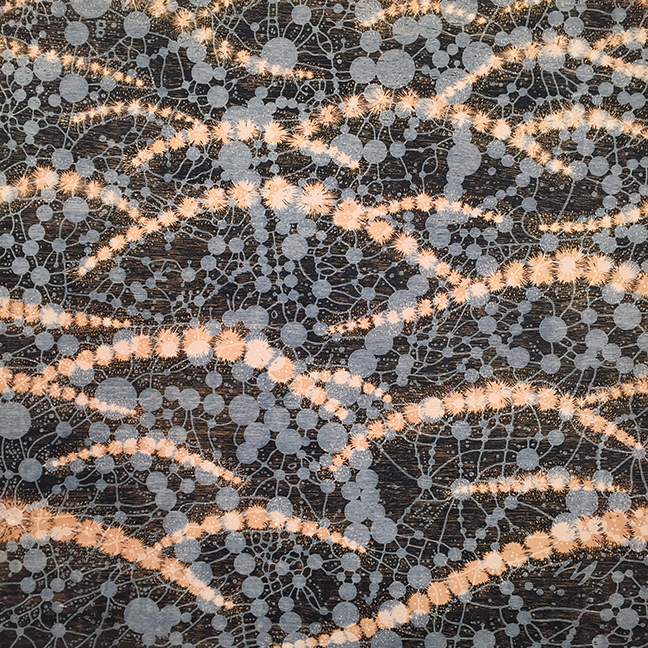 Stockton’s prints can simultaneously evoke landscapes as well as cellular activity. She is inspired by the natural world observed and the primordial world imagined. Her imagery often starts off connected to a specific place. For example, she is an avid hiker with a particular fondness for the northern coast of Nova Scotia. Her large woodcuts are printed from three-foot square woodblocks that she hand carves, a different block for each color layer. The scale of these works is mesmerizing, a testament to her mastery of this art form. Her prints are made with the assistance of master printers Susan Goldman of Lily Press, Rockville, MD and Chris Shore of The Center for Contemporary Printmaking, Norwalk, CT. The presentation of certain prints in ensemble groupings helps Stockton explore her themes of variation, emergence and evolution. Through her careful layering of color (sometimes in combination with watercolor washes and/or tea baths), Stockton’s images challenge our perceptions of the natural world around us. 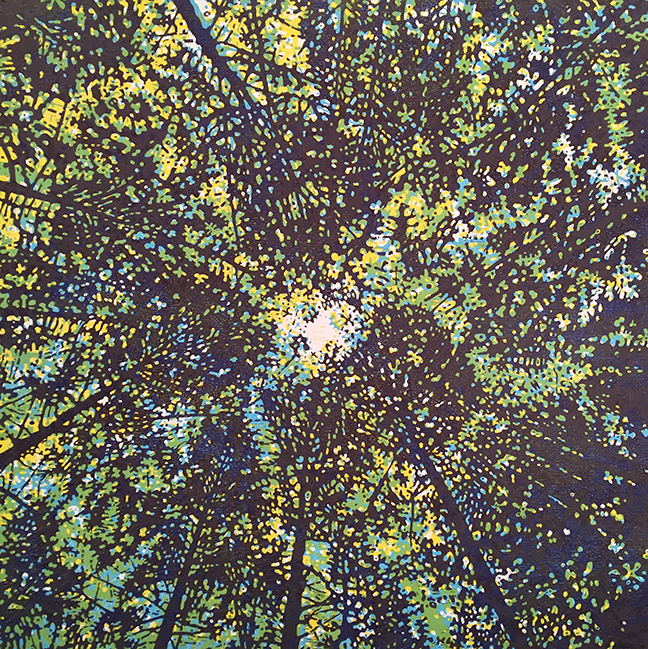 Eve’s woodcuts were recently on display at the National Academy of Science’s Keck Center. She has had one-person exhibitions at Long View Gallery, Washington, DC; Brown University, Providence, RI; the Wexford Arts Center, Ireland; and at the Inverness County Centre for the Arts in Nova Scotia. She won the Second Prize Award in The Prints America juried competition (juror: Jacob Lewis, Pace Prints, NYC) and Best in Show Award at the Ridgefield Guild of Artists juried competition (juror: Benjamin Genocchio, NYTimes). Her print was published on the cover of the February, 2015 cover of Nature Genetics Magazine. Eve regularly exhibits in the DC, CT and NY areas. Her work can be seen at Long View Gallery in Washington, DC; Kenise Barnes Fine Art in Larchmont, NY; Heather Gaudio Fine Art in New Canaan, CT; and K. Imperial Fine Art in San Francisco. Eve’s artwork is in numerous private and public collections. Many of her woodcuts are in the collection and on exhibit at NYU’s new Langone Medical Center.